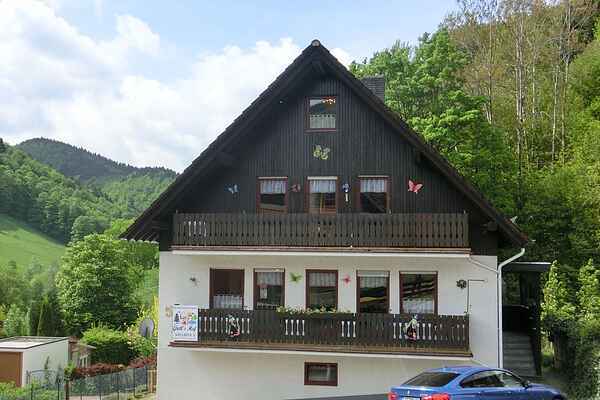 Spend a fantastic and adventurous holiday in this cosy apartment in one of the most beautiful valleys of the Harz region. The picturesque village of Sieber is situated on the edge of the Harz National Park in the Sieber Valley with its extensive forests, challenging differences in altitude and magnificent distant views. This \"oasis of peace\" is right here, where nature's beauty and numerous hiking trails start literally on your doorstep. At the same time, it only takes a few minutes by car and you'll experience the \"vibrant\" part of the Harz with its many cosy small towns, stunning villages, cultural-historic sights and adventures. Whether it's just the two of you, the whole family or you're here with friends - each guest is equally welcome here. The apartment is fully equipped and comfortably furnished. Neither children nor adults will be bored here. Dartboards, pool, a multi gaming table, game consoles and many other playing options await you. If the weather's nice, you're welcome to enjoy the well-kept garden. From June to September, guests can also use the swimming pool in the garden. Guided pony rides are available as well. In the immediate vicinity you'll find numerous restaurants. The Harz region is a year-round destination and a grand adventure for young and old. Plenty of leisure and recreational facilities offer something for everyone. During the winter months, you'll find the cross-country ski trails almost directly next to the house, while the large ski resorts in St. Andreasberg, Braunlage or the Bocksberg in Hahnenklee can be quickly reached by car. Popular destinations: Brocken (30 km), Harz narrow-gauge railways (30 km), high rope course (10 km), enchanted forest (35 km), ship excursions (35 km), swimming pool (500 m), thermal baths (20 km), UNESCO World Heritage Site Goslar (50 km), Quedlinburg (70 km), Wernigerode Castle (50 km), western city Pullman City (40 km) and lots more. Come and experience it for yourself.